Whips, high heels and big hats, the saddle, stiff drinks: What do all these have in common? If you answered anything other than this weekend’s Kentucky Derby, we look forward to getting to know you better. The Derby’s one of our favorite weekends of the year. Great horse-watching and people-watching, a bit of friendly wagering, and an excuse to have friends over and sip mint juleps in the middle of a Saturday afternoon. At last year’s Derby party we realized that quite a few attendees weren’t big whisky fans, which is why we’re making a small tweak for this year’s occasion. We’re offering the traditional Southern version of the mint julep, but we’re also serving the Ivy Gimlet for vodka-lovers. We all know The Ivy as the Los Angeles restaurant where young Hollywood hangs out to be photographed. But they also shake up that wonderful drink called the Ivy Gimlet. We love gimlets, but we don’t want you to confuse this one with the usual Rose’s and vodka. In fact, they couldn’t be more different. 1. Crush mint leaves with a pestle. If you don’t know what a pestle is (for the record, it’s one of those bat-shaped wooden tools no one has in their kitchen), you can use another blunt object. Use enough mint. A lot. 2. Combine ice, 1 shot vodka, 1/2 shot simple syrup, and a touch of fresh lime juice into a metal shaker. 3. Cap your shaker and give it a good 15 second shake. 4. Pour the drink into a chilled glass. You can use martini glasses, but we think a balloon glass, highball, or old-fashioned is cooler. We don’t like non-martinis in martini glasses. 5. 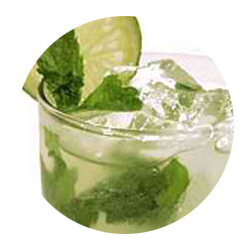 Garnish with lots of mint and a slice of lime.